Sony has refined the HT-NT5 for extreme musicality but, as a trade off, it doesn't have the oomph for cinema-quality sound reproduction. In a world where soundbars are largely regarded as functional necessities rather than proper audio kit, it's reassuring to encounter the Sony HT-NT5. This £599, $700US, AU$999 2.1 sound system is a cut above the commonplace, both in form and function. With a Hi-Res Audio badge to indicate solidarity with 24-bit sound sources, and some touches of designer flash in the cosmetics, it's an intriguing proposition. Sitting at the top of Sony's 2016 soundbar line-up, the HT-NT5 system comprises a wireless subwoofer and slimline soundbar. The latter boasts a smart hairline finish, and features a three-way speaker design comprising a pair of mid-range drivers, flanked by a gold-ringed high-frequency super tweeter and a secondary tweeter on the edge of the unit. Inside, there's a Sony S Master digital amp module for every driver. Around the back are two connection wells, one with an Arc-enabled HDMI output, plus two inputs, the other with a third HDMI, plus optical digital input and Ethernet. All three HDMI inputs support 4K Ultra HD sources. There's also a USB port on the right hand side and Wi-Fi, for the record, is dual-band. The subwoofer is relatively compact, distinguished mainly by a front-facing high gloss port. Setup is pleasingly straightforward. The crossover with the sub is managed automatically, so it's simply a matter of placement and managing the volume. Wi-Fi is supported by NFC and Bluetooth covers both AAC and higher-resolution LDAC. The HT-NT5 can also be used as part of a multi-room wireless system, integrating with other Sony wireless speaker systems through the brand's SongPal app. The system ships with a dinky little remote, but the soundbar also has touch sensitive controls and a display that does that clever thing of appearing to glow through the bodywork. Very stylish. The package includes two small wall-mounts for those that would prefer that option, but you can also sit the 'bar on AV furniture. It is wide though, at 108cm, so make sure you have enough space. The soundbar's Home page provides a pictorial shortcut to all inputs and sources, including networked or NAS and PC devices. Integrated services boil down to Spotify Connect and Google Cast, which effectively opens up a host of apps from your smartphone, including TuneIn radio, Qobuz and Google Play Music. The HT-NT5 soundbar performs differently, depending on its orientation – but the change is not as drastically as you might imagine. Stereo imaging is at its most pronounced when the speaker is in its on-wall orientation. Sat flat, the angled midrange woofers sit within an acoustic dimple, leaving the edge facing tweeter keeps the soundfield crisp. Don't worry about sorting which way is which, though, the HT-NT5 is smart enough to optimise sound performance depending on the positioning. The subwoofer, on the other hand, can sound a little pendulous but at least it's not overly intrusive. All that said, the HT-NT5 soundbar is refreshingly musical. Rush's classic hard-prog "2112" is well handled with Geddy Lee's high-pitched vocals coming through loud and clear, and a reassuringly sharp edge to the axework. "Lessons" flits between acoustic noodles and clenched fist riffs, with an energy that belies the fact this is a TV soundbar. With movies, the HT-NT5 offers similar enunciation. While it doesn't come close to emulating a genuine surround soundstage, it has no problem sounding urgent and exciting. The theatrical trailer for Burnt (the Bradley Cooper foodie flop), uses cutlery as a percussive instrument, allowing the 2.1 system to sound fast, insistent and dramatic. The HT-NT5, it turns out, is great with knives, forks and spoons. There are limitations though. When a bellowing Jake Gyllenhaal gets punched in the face at the start of boxing drama Southpaw, the sub thumps but doesn't drop significantly below the belt. The sub starts to make itself known at 31.5kHz, but doesn't really start to agitate pottery below 50Hz. The mid-range woofers come in at 100Hz, with the tweeters kicking in around 200Hz. Onboard amplification is rated by Sony at a combined 400w, but you should take that with a pinch of salt. With audio sources and Blu-ray, there's enough poke to make you grin, however the output level of Sky's DD 5.1 feed has long been relatively low, so with Game of Thrones, I had the system racked up to Max volume, and it still wasn't enough to really attract the ire of White Walkers (or my neighbors). 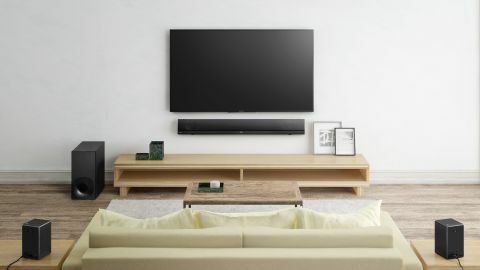 The stereo width of the soundbar is best appreciated when in its wall mount orientation, but dialogue remains largely balanced between the horizontal and flat use. As Daenerys Targaryen's dragons first appear at the start of The Battle of the Bastards (Season 6, episode 9), there's a great unfurling of wings and collapsing rubble. The wings aren't quite as leathery as you might hope, but when the dragons belch fire over slaver's bay there's a pleasing wall of noise. Overall, the HT-NT5 is an accomplished 2.1 package that looks splendid and offers a level of mid-range clarity that cheaper bars typically can't match. It's prim and precise, musical and extremely mannered. If Pride and Prejudice is your bag, you're sorted. If the system does have a limitation however, it's the subwoofer. It really doesn't quite go deep enough to do justice to more visceral content – like the thud of a punch or rumble of an engine – but it's well equipped in terms of connectivity at least, and offers a heap of file compatibility. With its ultra slim design and 4K HDMI-ready inputs, the HT-NT5 is both good looking and forward facing. It may be a TV soundbar, but this Hi-Res Audio-ready soundbar's also an audiophile-grade component in its own right. At times the system can sound a little too sharp with movie content, and it doesn't really plumb the depths when deep LFE is required. It's almost too refined for its own good – seriously, it's like it was designed by your next door neighbor – and it's best suited to large flatscreen TVs than tiny 32-inchers. With the HT-NT5, Sony has produced a soundbar with audiophile aspirations and an unapologetic upmarket design. Disarmingly versatile, it works equally well on furniture as on-wall, and generously offers a trio of 4K-ready HDMI inputs, plus compatibility with FLAC and DSD audio files. On the debit side, however, it's not massively powerful and the sub is definitely PG-rated.